There have been plenty of tributes to the great man on the Internet since last Wednesday and many of them have said what I felt in my heart about the best football manager in the world. 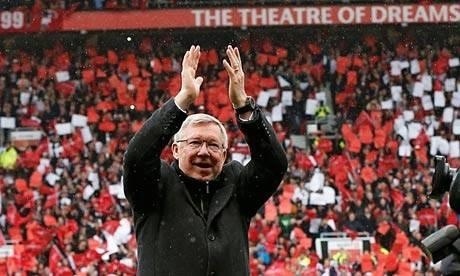 Seriously, there’s nothing more I can say, except that I cried really badly last night from the moment Fergie walked out of the tunnel towards the guard of honour his players had formed for him to the moment he began his final speech at Old Trafford. In fact, I welled up every time I read another tribute to Fergie. It’s that bad. It was 1am and I was a blubbering mess, with tears welling up and sniffles in my nose. It felt equivalent to a heart broken by a failed relationship. I had been grieving a loss since last year, so yes, I am very familiar with the concept of a heartbreak. I am Manchester United through and through. I have been a fan ever since I watched Eric Cantona with his popped collar volleyed the ball past the throngs of players to score the only goal against Liverpool in the 1996 FA Cup final. United won 1:0 and my football soul was pledged to the team ever since. The mesmerising moment can be found in the video below. So yes, I have never known a world without Sir Alex as the manager of Manchester United. Because of SAF, I have known and lived the pride and joys (and pains) of being a red. Thank you, SAF, for 27 years of glory, late comebacks, last-minute winners, the wins and even the defeats. You too have given me some of the best experiences and memories of Manchester United. Because of you, the impossible dream was made possible.